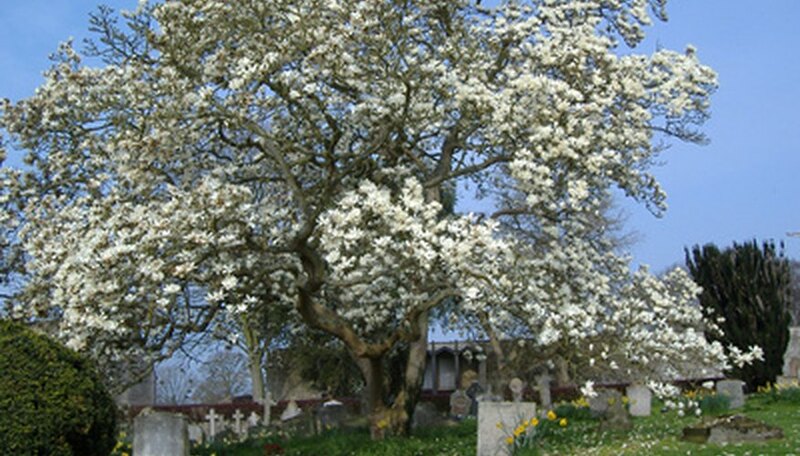 A magnolia tree in full bloom is a wonderful sight to behold in any landscape. They are relatively easy to grow from seed, provided care is taken in the collection and preparation of the seeds. The best time to collect the seeds is in the fall after the cone-shaped fruit has matured. Allow the cones to dry for a few days and then shake them to release the seeds. Seeds can also be purchased from professional growers and nurseries. If buying seed, be sure to choose a variety that is suitable for your USDA plant hardiness zone. Soak the seeds in a glass or jar of warm water overnight. After soaking, the seed coat will have softened. Rub the seeds with a piece of window-screen mesh or hardware cloth to remove the seed coat. Make your potting medium by blending equal parts of the potting soil, sand and peat moss. Fill the cells of the planting tray and place one seed in each cell. The seeds should be about one quarter-inch below the surface of the soil. Add enough water to moisten the soil. Put the tray inside the plastic bag and seal it to keep the humidity high. Place the bag in a warm location but not close to a direct heat source. The top of the refrigerator or a similar location higher up in a room is usually a good spot. Open the bag several times a day to allow air circulation, and add water as needed to keep the soil moist. Remove the tray from the plastic bag as soon as the seeds sprout and place it in a sunny location such as a window sill. Germination normally occurs within six weeks of planting. The seedlings can be transplanted to small planting containers when they have grown several sets of leaves. Use the same potting mix as you made for the planting tray. Transplant the young magnolia trees to the garden in spring. Any seeds that can't be planted immediately should be stored in the refrigerator. The optimum storage temperature for the magnolia seeds is 32 to 41 degrees F. Allow the pulp to dry first and then place the seeds in an airtight container. Seeds gathered in the fall can be safely stored over the winter and will be viable for spring planting.